An antique Poland Springs water bottle is quite a find for the bottle collector. Poland Springs is one of the oldest bottled water manufacturers in the United States. The Poland Springs story began in Maine in 1793 when the Ricker family settled by the spring and opened the Wayside Inn. Over the next ten years the purity of the water became well known and the Wayside Inn was perceived as not only an inn but a health spa as well. In 1845, Hiram Ricker had the idea to bottle the popular spring water so that people who could not make the trip to the Inn could also enjoy the touted health benefits. The popularity of the water grew and in 1904 Poland Springs waters had earned medals of excellence, as well as taking top honors at both the World's Columbian Exposition and the World's Fair. The first bottling houses were completed in 1907. Over the past 100 years there have been many different Poland Springs water bottles made. Some are rarer and have more value than others. The Moses bottle was created for the grand opening of the Poland Spring Hotel in 1876. Filled with the healthy spring water, it was given to everyone who attended the opening as a keepsake. 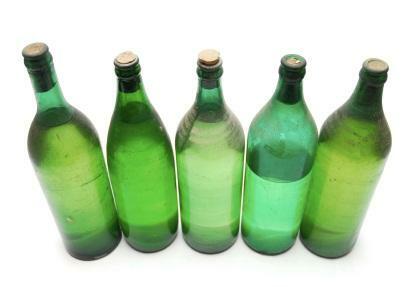 From 1876 to 1972 there were over 40 different varieties of Moses bottles made. Each signified a different event from honeymoons to special celebrations. They come in various sizes, colors, and shapes and are highly sought after by collectors. You can see some excellent examples of a variety of Moses bottles on this site. Some of the oldest bottles were salt glazed crockery ones. This bottle is a good example. Of course you may find many more Poland Water memorabilia if you keep your eyes open. You can find antique Poland Springs water bottles on eBay and through bottle collectors clubs. The Moses bottles tend to fetch higher prices than some of the others but they are all affordable to most collectors. All antique bottles look beautiful displayed with light shining through the colorful glass. The safest way to do this is to display them in a glass front, lighted cabinet. This way you can enjoy the beauty while protecting the bottles from breakage, fading from the sun, and dirt and dust build up. You may also enjoy this slideshow, Identifying Old Bottles.